Blondie is often described as the butterscotch counterpart of brownie, only without chocolate. I took a step back and approached the problem differently. What if I start from a brownie recipe instead? More specifically, a cocoa brownie recipe. Cocoa powder is gluten free. It contributes significant flavour and bulk to brownie. It is exactly the role I want kinako to play in my blondie recipe! I reached for my favourite cocoa brownie recipe from Alice Medrich and doctored it some more. 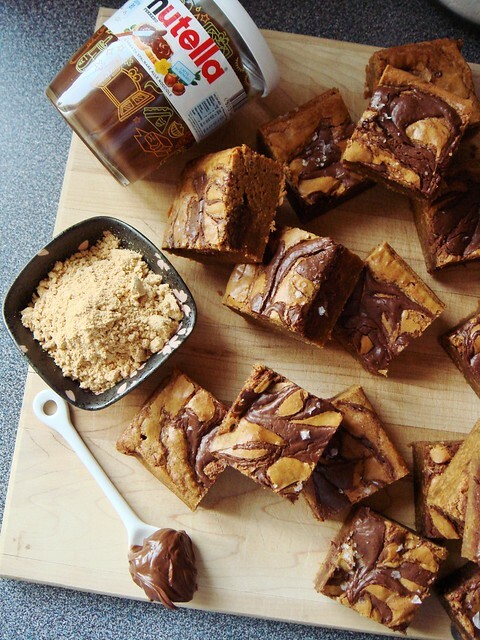 Dark brown sugar replaced white sugar to create blondie’s signature butterscotch flavour. 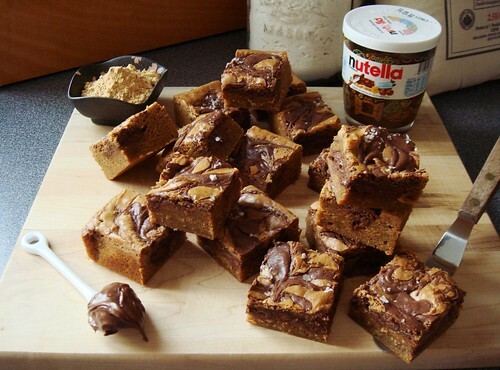 Nutella was swirled into and on top of the blondie. Sprinkles of flaky sea salt balanced the sweetness. The fragrance from the freshly baked blondie was irresistible. The deep toasty aroma of kinako mingled with sweet cocoa hazelnut smell of Nutella. The thin crackly top was textbook perfect. It looked at home with the puffy Nutella swirls. But the best part? The fudgy texture took top honour. The rich bar cookie was best served in small portions. Set oven rack to the middle and preheat oven to 325F. Line a 20cm or 8in square cake pan with parchment paper in perpendicular direction to form a sling. Place butter, brown sugar, and 1/4 teaspoon fine sea salt in large heat-proof mixing bowl. Set the bowl over a saucepan of boiling water over high heat until content melts. Alternatively, microwave on high at 30 seconds interval until melted. Whisk until smooth. Set aside until mixture is warm to touch. Add vanilla extract and eggs to mixing bowl and whisk until glossy. In a small mixing bowl, sift together flour and kinako. Tip flour mixture into large mixing bowl containing butter. Using a large silicone spatula, fold batter until you no longer see large streaks of dry flour. Next, stir vigorously for one minute (about 40 strokes). The batter ought to be smooth and glossy. Fill prepared pan with batter and smooth to an even layer using a small offset spatula. 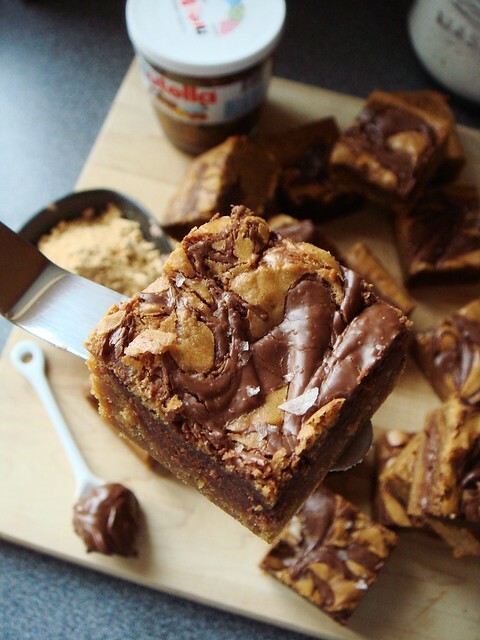 Take 100g of Nutella and dollop by small spoonful on top of batter. Drag a thin knife all over to create swirls. Smooth the top once again. 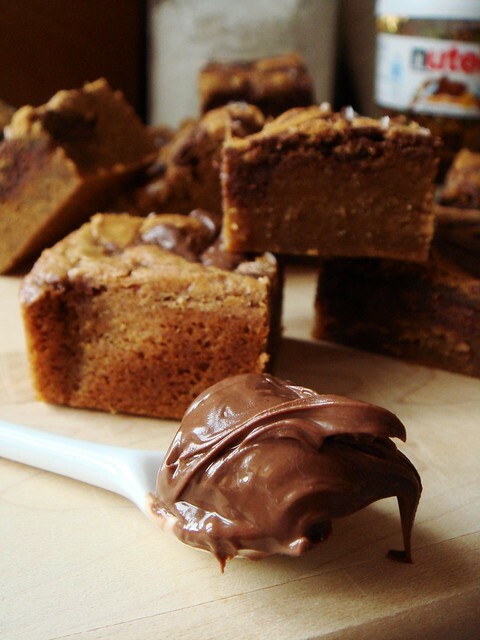 Take the remaining 50g of Nutella and warm in microwave for about 20-30 seconds until it becomes thin enough to pour. 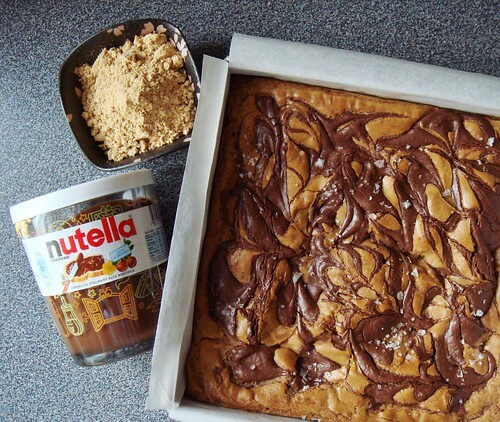 Pour five parallel lines of Nutella over top of batter. Using a toothpick, drag across the batter to create an attractive swirly pattern. Sprinkle with flaky sea salt. Bake for 40-45 minutes or until blondie is no longer jiggly in the middle. Test for doneness with a toothpick. Try to pick a spot in the centre without hitting a dollop of Nutella. The toothpick should come out with a few moist crumbs. Let cool on cooling rack until it reaches room temperature. If you want very neat slices, chill in fridge for about 30 minutes. With the help of parchment paper slings, lift the bar cookie from cake pan and transfer to cutting board. Cut into 9 or 16 squares. Stays fresh in air-tight container for up to three days.